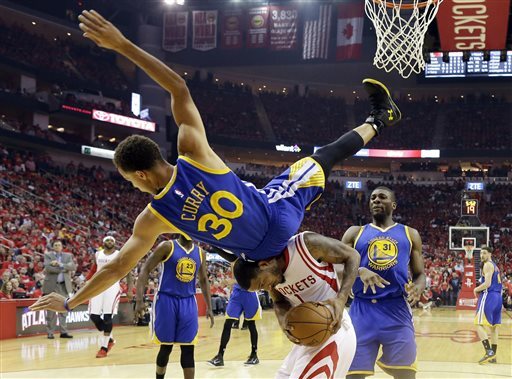 HOUSTON (AP) — When Golden State’s Stephen Curry crashed into Trevor Ariza’s shoulder, was upended and sent flying toward the court on Monday night against Houston, it felt like forever before he landed. The MVP was able to return to Game 4 of the Western Conference finals after the spill but the Warriors couldn’t overcome a big deficit, as James Harden scored 45 points in the Rockets’ 128-115 victory. Curry said he went through the concussion protocol before returning. The collision came when Curry jumped in the air as Ariza was about to go up for a shot midway through the second quarter. 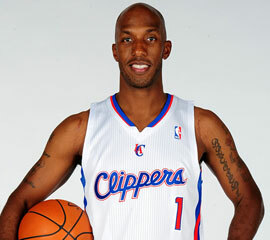 Ariza saw him and stopped abruptly, causing the spill. Curry’s head hit the court and it propelled him up and back onto the floor, where he remained for several minutes. Curry looked dazed as he was attended to before slowly getting up and walking off the court. It wasn’t only frightening for him. His coaches and teammates were all worried when they saw the hard fall. Curry missed the remainder of the half with what the Warriors called a contusion, but after undergoing a series of tests he returned to the game midway through the third quarter. Klay Thompson had 24 points and Curry added 23 for Golden State, which moved a win away from its first trip to the NBA Finals since 1975 after routing Houston 115-80 on Saturday night to take a 3-0 lead in the series. But the Warriors couldn’t put the Rockets away and will try again at home in Game 5 on Wednesday night. Houston bounced back from a 3-1 deficit to the Clippers in the conference semifinals. But they face a much bigger challenge in this series, as no team in NBA history has won a playoff series after trailing 3-0. Dwight Howard had 14 points and 12 rebounds, and received a flagrant 1 foul early in the third quarter after throwing an elbow at Andrew Bogut’s head. He would be suspended by accumulation of flagrant foul points if the NBA upgrades it to a flagrant 2 after review. The Warriors made 20 3-pointers and Houston had 17 to set an NBA record for most 3-pointers combined in a playoff game. Houston led by 23 after one and a basket by Howard to start the second made it 47-22. Four quick points by Thompson got Golden State within 55-36 when Curry was injured. He was called for a foul on the play and Ariza made both shots to extend Houston’s lead to 57-36 with about six minutes until halftime. Thompson picked up the slack with Curry out, hitting four 3-pointers in a 23-9 run that get the Warriors within 66-59 with about 30 seconds left in the first half. But Terry hit a 3 as the shot clock expired to put Houston up 69-59 at halftime. The Rockets led by nine when Curry re-entered the game midway through the third quarter. He shot an airball on his first attempt after returning and his second try was blocked by Terrence Jones. “It took me a couple minutes just to get back in the rhythm of the game,” Curry said. The Rockets jumped out to a 12-0 lead thanks to eight points by Josh Smith and five straight missed shots by the Warriors to start the game. Smith’s hot shooting continued throughout the quarter and he made all five shots, including three 3-pointers, he attempted in the period. The Rockets made 17 of 22 shots overall in the quarter and were an astounding 8 of 9 from 3-point range to lead 45-22 entering the second. Houston’s 45 points tied a franchise record for points in a quarter in the playoffs that had stood since 1980. Warriors: Shaun Livingston started the second half in place of Curry and finished with four points. … Draymond Green had 21 points before fouling out in the fourth quarter. Rockets: This was Harden’s fifth game this postseason with at least 30 points. … All of Houston’s starters scored at least 10 points. … Smith finished with 20 points.